Successful social collaboration is ultimately judged by business results, not theoretical advantages of one mode of collaboration over another. Part of what distinguishes a successful implementation from an unsuccessful one is a strategy for achieving some initial results quickly, giving the network time to deliver more substantial results over time. This analysis of potential payoffs will be different for every business, but here are some of the usual suspects. Organizations increasingly market their products through social media, seeking to spark viral sharing and bring in tons of sales leads. It’s a beautiful thing when it works. Individual salespeople also use social networks for prospecting and researching opportunities, and to promote themselves and forge connections with potential customers. The potential of internal collaboration to drive sales may be less obvious, mostly a matter of making connections behind the scenes that make a difference. Cutting the time required to produce a proposal is one way how social collaboration can pay off. The proposal may also be more likely to succeed if the salesperson can tap the knowledge of the right people, including product experts and people who have worked with the prospect in the past. The synergy of social collaboration and sales tools is another practical advantage to using social media. For example, when Salesforce.com and Chatter are used together, the activity surrounding a sales opportunity can be represented in the Chatter feed. Employees can choose to follow Customer and Opportunity records in Salesforce.com, just as they might follow an individual. Viewing one of these records in Salesforce.com CRM also brings up a listing of Chatter commentary about it, as shown in the following figure. 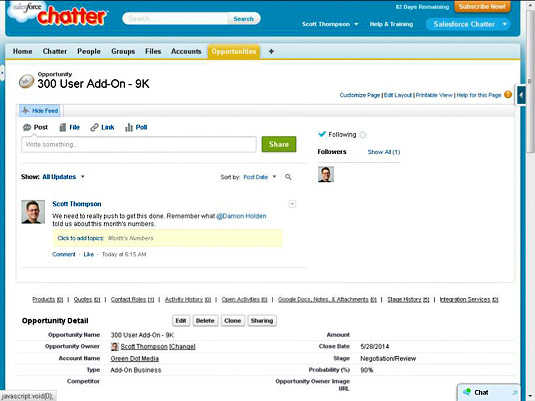 Chatter provides social commenting on records in Salesforce.com CRM. Microsoft created a similar integration between Yammer (a cloud-based social platform it acquired in 2012) and Microsoft Dynamics CRM. If you’ve got questions, the social network has answers. Even if you have no idea who to ask, you can post your question to a general feed and see who answers. If your question has been asked before, you may be able to search to find your answer without having to pose it again. When the same questions come up again and again, it makes sense to organize them into some sort of knowledge base or frequently asked questions document. That doesn’t always happen, however, making the ability to search the social stream an important capability. Even if you don’t find the answer to your specific question, you may find people who have posted on related topics. Remember that social collaboration is about people, not just data. Find the people with the right expertise and ask them your question. Very likely, your search will also turn up social collaboration groups associated with professional interests, projects, or departments, all of which can be avenues to finding either the information you seek or the right people to ask. The payoff here is in the form of less time wasted, less guesswork, better knowledge sharing, and smarter business decisions. Every organization runs at least partly on projects: groups of people working together to accomplish some common goal. All participants in a project can use social collaboration for routine project status updates, thus contributing to better project management. This can do away with most tedious status report meetings. The need for meetings in general may be reduced to the extent that decisions can be driven through social collaboration. And when meetings are truly necessary, folks can focus on decision-making rather than status reports. Some social collaboration environments also provide features specific to project and task management. Often, this is positioned as lightweight project management that doesn’t attempt to replicate all the capabilities of the tools used by professional project managers. In other words, you might not want to use a social collaboration tool like the Activities function in IBM Connections to build a bridge or an airplane (a complex technical project with dependencies between tasks requiring precise tracking), but using it to plan a conference would be perfectly appropriate. In fact, that’s one of the things IBM uses the software for internally. Social project collaboration puts the emphasis on integration with the social environment, providing a smooth transition from a social post (Hey, somebody ought to do this!) to creating a task (Good idea; you do it, and your deadline is Friday at 5 p.m.). Assigning a task becomes as simple as tagging someone in a post. Many companies are under considerable pressure to find their next hit, or even to turn around a struggling company. Ideally, some of these ideas will arrive spontaneously through ongoing discussions in the social collaboration system. A great idea is proposed, refined, and recognized by someone with the power to make it happen. That’s great when it happens, but sometimes innovation needs a little nudge. One way to seek ideas for new products and services, as well as money-saving ideas for current operations, is to leverage the power of the crowd. This can be done informally (through questions or challenges posted to social collaboration streams) or in a more structured way (using an application geared to gathering and organizing ideas). Often, this includes a voting mechanism for identifying the best ideas. Some crowdsourcing initiatives are public, such as appeals to customers, consumers, and freelance inventors to come up with new product ideas. There may be a prize and certainly will be public recognition for the best ideas, providing motivation for members of the public to contribute. This kind of online brainstorming also can work internally, with employees encouraged to contribute their best ideas. Employees have the advantage of knowing the company and its capabilities (as well as its shortcomings) and probably will be happy to be asked for their opinion.